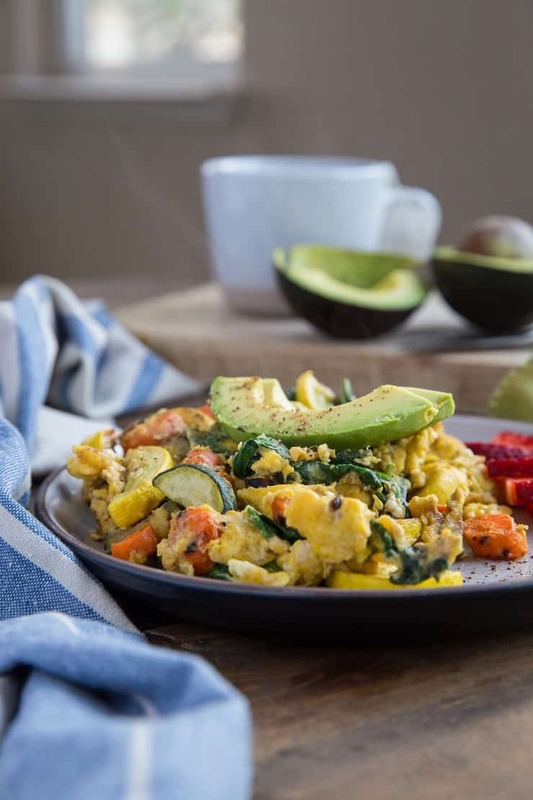 Roasted zucchini, yellow squash, and carrots take your breakfast scramble to the next level! This nutritious breakfast is easy to prepare and perfect for make-ahead breakfasts to eat throughout the week. You’re looking at the very breakfast I’ve been eating almost every day for the last 2 months. 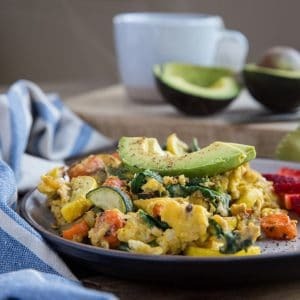 As you know, I’m on team savory when it comes to breaking the fast, and I always go for a veggie-packed scramble or omelette. Traditionally, I saute the vegetables prior to scrambling them, but lately the roasted version has been doing me well. I simply chop up a zucchini squash, yellow squash, and a carrot and roast for 20 minutes at 425. 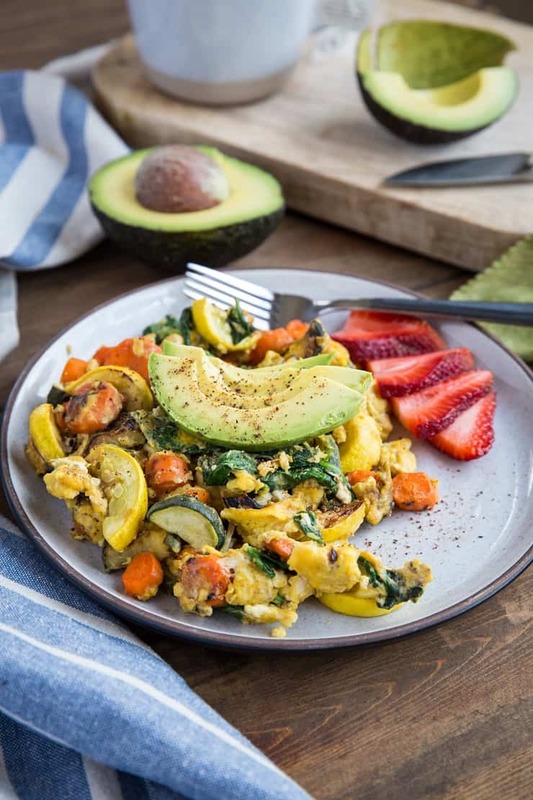 Because I take a ton of vegetables in my breakfast, this recipe makes enough for two breakfast scrambles. If you keep your vegetable intake at a more rational level, the recipe can stretch to feed four. If this seems like a lot of input for not a whole lot of output, you can easily double or triple the amount of vegetables. The other caveat to this roasted vegetable sitch is you can absolutely change up which vegetables you use. For instance, I’ve been known to do broccoli quite frequently. You can also go with cauliflower, sweet potato (or regular potato), bell pepper, etc. You can also use fresh herbs for flavor and added antioxidants. To breakfast meat and to cheese? You can absolutely throw a little bacon, sausage, or chorizo into the mix by cooking it up in a separate skillet. You can also add your favorite cheese if you do dairy. Hot sauce, salsa, guac, or avocado? You just let your hair right down! I always add a huge amount of baby spinach to my scrambled eggs (or kale if I have it on hand) for even more nutrients. Infusing every meal with a leafy green, or at least some vegetables is a smart way of getting in enough fiber to keep your meals well-balanced and nutrient-dense. 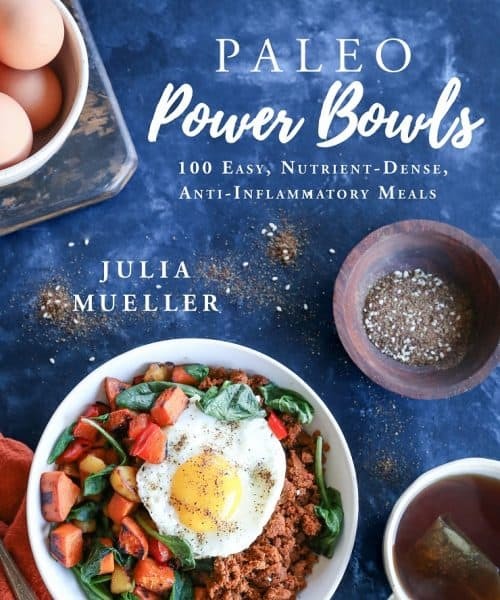 For those of you who are looking to add more protein into your life, while keeping it balanced with fiber, this is the ultimate approach to breakfast (regardless of the vegetables you use). If you can’t eat eggs due to allergy or intolerance, you can always enjoy leftover meat alongside your roasted vegetables. I do this quite often myself to take a break from eggs. 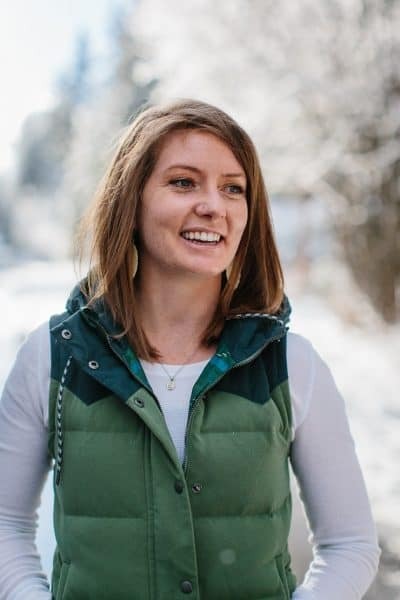 We don’t have to romanticize every meal, and breakfast certainly doesn’t have to be comprised of traditional breakfast foods. On the flip side, I’ve been known to eat this exact meal for lunch or dinner. Mixing and matching your meals is fully acceptable. I give you permission if you haven’t already given it to yourself. I hope you find some enjoyment in this nutrient-packed meal. 6 large eggs well beaten. Preheat the oven to 420 degrees F. Place chopped zucchini squash, yellow squash, and carrots on a large baking sheet and drizzle with avocado oil and sprinkle with sea salt. Use your hands to toss everything together until the vegetables are well coated. 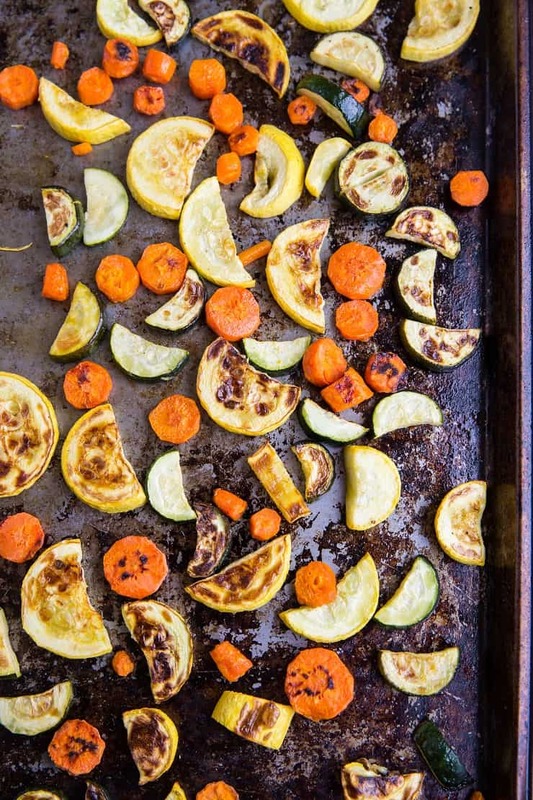 Spread vegetables into a single layer on the baking sheet. Roast 20 to 25 minutes in the preheated oven, until golden brown. Remove from oven. Heat a medium-sized skillet over medium heat with enough oil to lightly coat the surface, about 2 teaspoons. Add the baby spinach and cover. Cook, stirring occasionally, until wilted, about 2 minutes. Transfer the roasted vegetables to the skillet. Evenly pour the beaten eggs over the vegetables and sprinkle liberally with sea salt. Allow eggs to sit untouched for 1 to 2 minutes. Use a spatula to flip the eggs and cook another 1 to 2 minutes. Continue cooking and flipping until eggs are cooked through. This looks absolutely amazing! I can’t wait to make this! Scramble is exactly my daily breakfast, it’s so easy and flexible that we always can take advantage of our leftovers. Yummy all the time! !